Safely remove heavy swirls, scratches, etc. The P&S Ego Maker Compound makes quick work of even the heaviest of imperfections! This high-quality formula features efficient cut technology to restore the paint finish by removing sanding marks, scratches, and other ugly paint imperfections. According to P&S, the key feature of Ego Maker is the finish left behind after correction. Ego Maker is a uniform cleaning compound featuring a high purity refined alumina abrasive with a tightly controlled particle size and shape. This simply means that Ego Maker can correct heavy imperfections while also leaving behind a bright finish. 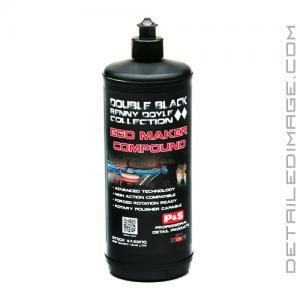 You may need to follow up this compound with a lighter pad/polish combo depending on the paint type you are working on. If that is the case, check out some other great P&S polishes listed below. Ego Maker does not contain any wax or silicones, making it safe for use in body shops. Don't let ugly imperfections take away from the overall luster of your paintwork, remove them with the P&S Ego Maker Compound instead! Ego Maker compound is designed for use with high action, forced rotation or traditional rotary polishers. Ego Maker restores the paint finish by removing sanding marks, scratches, and other paint imperfections. Ego Maker aggressively cleans the clearcoat paint surface preparing it for final stage paint correction. Safe for use in body shops. Contains no wax or silicone. Select your desired tool and pad combination. Apply a small amount of Ego Maker to the paint surface or pad and begin the paint correction process. Use light to medium pressure to remove paint imperfections. Work a 2' x 2' area or smaller and apply sufficient product to lubricate and provide sufficient cleaning. Take your time and repeat the process over entire paint surface. Inspect paint thoroughly to make sure all imperfections have been resolved.